Myopia, also called nearsightedness or shortsightedness, is a refractive error ( vision defect) of the eye in which with accommodation completely relaxed, parallel light rays entering the eye come to a focus in front of the retina, creating a blurred image. 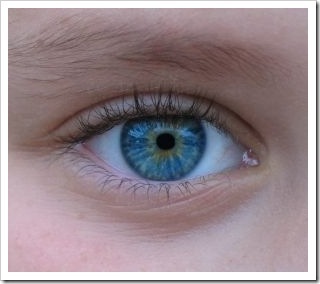 In the nearsighted eye, the eyeball is too long or the cornea is too steep (has too much curvature). As a result, the light entering the eye is not focused correctly and distant objects look blurred. Nearsighted persons have more trouble seeing distant objects as clearly as near objects. This problem is often noticed in school-age children who complain of having trouble seeing the chalkboard. As the eye continues to grow during childhood, nearsightedness typically progresses until about age 20. However, nearsightedness may also develop in adults because of visual stress or health conditions such as diabetes. Difficulty in seeing distant objects clearly is the only problem in simple myopia. Some improvement of vision occurs if the individual screws his eyes to narrow the palpebral fissure into a slit. This transforms the eye into a pinhole camera, with sharply focused images on the retina, in spite of the error of refraction. In high degrees of myopia, other symptoms occurs such as discomfort after near work (e.g., reading) and floaters, shadow-like shapes which appear singly or in clusters in the field of vision and occur as a result of vitreous degeneration. Simple Myopia, also known as non progressive myopia, starts around the age of 12, gradually increases and stops by age 21 years. It rarely exceeds 6.0 diopters (the measurement unit of refractive power). Degenerative Myopia, also known as malignant, pathological, or progressive myopia, starts around the age of 7 and continues to increase throughout life. 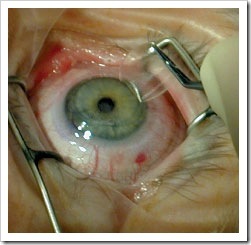 It is characterized by marked retinal changes and associated with a high refractive error (may reach 15 to 25 diopters ). Congenital Myopia, also known as infantile myopia, is very rare and present at birth and persists through infancy without progression. Curvature Myopia is attributed to increased curvature of one or more of the refractive surfaces of the eye, especially the cornea. Index Myopia is attributed to changes in the index of refraction of one or more of the ocular media, especially the lens . Myopia is detected with a vision test and refraction performed by ophthalmologists or optometrists. It is measured in diopters by the strength or optical power of a corrective lens that focuses distant images on the retina. A large number of persons with nearsightedness also have some degree of astigmatism, which can also cause blurring of vision. The treatment for myopia depends on several factors such as the patient’s age, activities, and occupation. There are many options available for correction of myopia. It is most commonly corrected through the use of corrective lenses, such as glasses or contact lenses. The corrective lenses have a negative optical power (i.e. are concave) which compensates for the excessive positive diopters of the myopic eye. Additionally, there is a growing number of refractive surgery procedures (e.g.,LASIK) which can be considered for permanent correction of mild to moderate degrees of myopia in adults. For people with higher levels of myopia, other refractive surgery procedures are now available; one of these procedures is implanting a small lens with the desired optical correction directly inside the eye (Visian ICL and Verisyse).